Our newest Taxidermy Studio, which is now over 6000 square feet, is located at 105 Henderson Branch Road just outside of Ingram, Texas. Wildlife Market Taxidermy prides themselves on the best service in the industry, the highest quality taxidermy and great pricing. With over 30 years of combined taxidermy and tanning experience, we offer only the very best taxidermy options for all North American and African game. Our Goal at Wildlife Market Taxidermy is to provide exceptional taxidermy at reasonable prices with a quick turn-around time. We only employ the best taxidermists in the World specializing in World Class North American Taxidermy (Whitetail Taxidermy, Elk Taxidermy, Wild Boar, Buffalo Mounts, etc) as well as all Exotic Taxidermy (Axis Mounts, Blackbuck Taxidermy, Red Stag, Ibex, Ram Shoulder Mounts, Bongo Lifesize Taxidermy, etc) from the State of Texas, and fine African Taxidermy (we receive from overseas and mount your trophies here quickly). When we receive your trophy, we collect a 50% deposit to begin work. Our taxidermy studio manager will go over options with you on how to mount your trophy from Wall Pedestal, Shoulder Mount, Life-size, Pedestal Base, etc. Next, we will remove the cape from the head of the animal, skull cap and remove horns if necessary. Measurements are taken on the animal, the skins are sent to our tannery, and the horns, antlers, and skull cap boiled. We typically receive the tanned capes back from our tannery within 2-3 months, and then begin the artisic process. 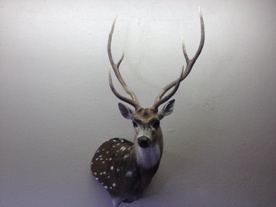 Upon completion of the taxidermy work, we will contact you to arrange pick up or crating and shipping details. The final balance is due at this time, before the mounts are picked up at our studio or shipped. If you would like your taxidermy to be shipped, we can arrange to do so either via UPS or Freight...crating and shipping charges will be applied. For payment of taxidermy work, we accept Cash, Check, Bank Wire, VISA or MC. This year, we received nearly 150 trophies taken from Africa. Should you decide to use Wildlife Market Taxidermy, we will provide you with Taxidermy tags to take with you on your African Safari to have your Outfitter apply to your skins, skull, horns and backhides you want to bring back to the United States to mount. They will forward your trophies on to an expeditor in Africa, to have shipped to us, via our importer in Texas. All of the import information will be printed on the Taxidermy Tags we provide you to take on your Safari. Also, inquire with us about discounts on multiple trophies taken on your African Safari. One of the biggest issues hunters have with taxidermists is the Turn-Around time in getting your mounts back to you. Depending on the time of year, our normal completion time to complete your taxidermy work, is approximately 6 months, twice as quick as most other taxidermy studios. Copyright © wildlifemarket 2013. All Rights Reserved.